This year, resolve to add more fiber to your diet...yak fiber, that is! We have plenty of fun and easy ways to make this resolution a reality. First, we are pleased to announce that one of our most popular yarns now has more yardage at the same great price: All Outlandish colors of Lhasa Wilderness yarn are now 2.7 ounce skeins with a generous 250 yards - that's 30% more than before! We're also pleased to share the third installment in our video series with Interweave! In this latest video, you'll get a closer look at our fiber and yarns which are produced to a "cashmere standard." 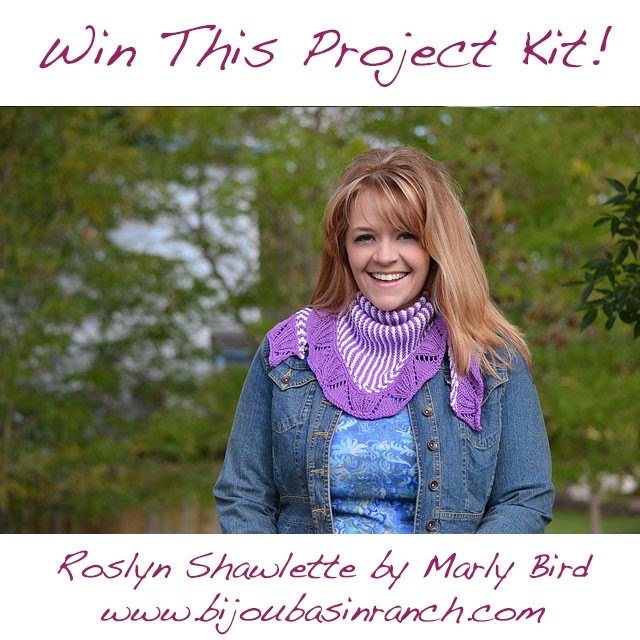 Watch the video below to learn more, then keep reading to find out how you can win a project kit from Bijou Basin Ranch! We'd love to hear about your favorite part about the video you just watched! Leave a comment on this blog post for your chance to win a Roslyn Shawlette kit which includes enough yarn to knit this stripey shawlette designed by Marly Bird! Be sure to also leave your Revelry ID or email address so that we can contact you if you win. We will randomly select a lucky winner to announce on our next blog post; be sure to sign up for our newsletter and follow us on Instagram, Facebook, & Twitter to stay updated on the latest BBR news for 2015. Good luck! Am I the first commenter? Wow! Love this stripey project!! I never knew about the cashmere standard. Love it! Love the part about how his customers know the yaks by name. Small, family owned/run businesses are the best!! I love how much you enjoy what you do and hearing about how you got started. My ravelry name is rheaume. The love you share with your Yaks shows how much love goes into your yarn. It's beautiful just like your yarn! I love the way your passion shines through in your video. I believe when you are passionate in what you do, others will follow. pinkshabbyroses on RAVELRY. Love seeing the yaks up close and personal. Did not realize they were so docile. I like the fact that the fiber is grown locally. Actually had the opportunity to meet the two of you at Estes Park. Love your products. I love the way they name all their animals. I enjoyed the story about the first fiber show you went to in New Mexico. I liked hearing about why I love yak yarn so much ; the cashmere standard. So soft and and great stitch definition. Wow!! I didn't realize that you guys were able to gather the fiber off the yaks so easily. And that yaks were so docile that you are able to be that hands on with them. Very cool!! My Ravelry name is Lildeb831. LOve the video! enjoyed hearing about you and the yaks!!! I loved seeing the twins and also seeing how caring you both are about your animals--I can't believe they are so docile!! Several years ago at stitches South you gave me a little fluff of yak yarn to tuck in my bra to see if I had any irritation from it--I didn't even after wearing it for three days. I got some money for Christmas and I know where I'm going to spend it!! Sadly, I guess my comment disappeared ... but I had mainly said that you inspire me and give me hope that we will one day get our farm/ranch up and running again. My dad was so gentle with his cattle that when they were out to pasture, he would call for them and they'd all come running!! Love your yarn and colors; and I love and appreciate you customer interaction! My Rav ID is phoenixanew. As a family with twin boys, our favorite part is the twins! I love seeing how proud you are of your product and how passionate you are about your beautiful yaks. The pride and love show through with a totally awesome product. Gorgeous colors and pattern. It is stunning. It was really interesting to learn that this yarn is especially good for cabled projects. I just learned cables this past summer so I cannot wait to try it out with Bijou Basin Yarn!! Ravelry ID: goldieaus or email: goldieaus@gmail.com. I love how the spinners just pushed you out of the tent when they started spinning your fiber and called everyone in to see! The history behind your business is very interesting! As always my favorite part is watching the interaction with the animals. My favorite part? The yaks! Love that red color! I need to go put some in my shopping cart. The close-ups of the yarn are so beautiful. I wanted to reach in and touch them all. Gorgeous! I loved the Yaks! And the story about customers asking about the Yaks by name. I am sockNubbins on Rav. I love the cashmere standard! I also love "meeting" the people who grow the yarn. If feels much more personal. Enjoyed learning about the cashmere standard and seeing the twins. Love the feel of the yak yarn. Thank you for the opportunity to win this kit. Enjoyed the part where he talks about how his customers know the yaks names he showed such love towards these beautiful animals. Spinners getting so excited about fiber that they pushed you out into the rain. Too funny. Love Love Love your yarn! I love everything about your video. Your place looks like heaven. The yaks are adorable, but what really stood out in this video is just how beautiful the land is. Oh my goodness....would love to knit with yak fiber as my goal this year is to use new types of yarn. I was really interested in the "Cashmere" standard. So cool to learn about the characteristics of various fibers. This would be wonderful to win! Thank for hosting this giveaway! I LOVE Bijou Basin! How cute are the twins names "Knit" & "Purl"! I was surprised to see how small the yaks are - somehow I thought they were larger. Great video. My favourite part was hearing about how high your standards are - good to know you are committed to quality! Have always loved hearing about how your company operates, how it cares for the animals, why you do what you do. I saw Carl and Marly Bird first on Knitting Daily TV several years ago talking about your operation. 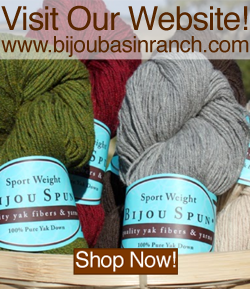 I have a fondness for American Grown and produced yarn and so have always enjoyed what little Bijou Basin I could lay my hands on. Keep up the good work. I just love seeing how much you love the yaks. They're so cute. I love that you let customers name your babies! How are Knit & Purl? 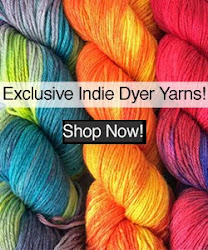 Outstanding yarn company! beautiful animals and gorgeous yarn.Hoping to win.sjb1knits on ravelry. I look forward to your webpage updates and pictures of your animals. Like to support local businesses too. Rav ID:charlottefranc. Very interesting video, keep up your great job!! What is not to love, YAKS! My favorite part was the comment about the customers knowing the animals names. They look friendly and kind of cuddly! Honestly, I loved seeing the yarn - such gorgeous colors. I also appreciated seeing the animals (and the obvious love for them) that provide the fiber for all that beautiful yarn. My favorite part is that you love meeting "us". 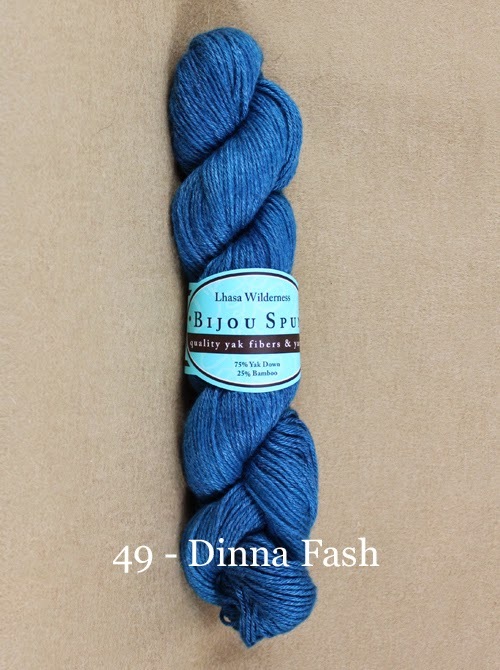 I know that the time I've spent talking with you at Midwest Fiber Festival only makes me want to buy more of your yarn. You are both personable and your passion for your yarns and animals shows as much as my passion for my knitting. Hope this doesn't appear twice! I love your yarn and am looking forward to starting the design on a stranded sweater for next year's Taos designer competition. It'll be in your Himalayan Trail Yak/Merino blend, in southwest colors. See you in October!